The VIA VB7001 Mini-ITX mainboard is the first VIA mainboard powered by the 1.5GHz VIA C7-D processor, the world's first Carbon Free processor. Defining a new era of clean computing, VIA ensures that the carbon dioxide produced in the operation of the processor is offset through a comprehensive program of activities, as well as through remarkably low power use, setting new standards for performance per watt operation. With reduced power consumption across the whole platform, the VIA VB7001 mainboard is designed for next generation, power efficient mini embedded PCs. Combining flexibility and a rich feature set, the VIA VB7001 supports up to 1GB of 400/533MHz DDR2 memory, two SATA connectors, and 10/100 Mbps Ethernet for smooth broadband performance. The platform also includes a PCI port, serial, parallel and USB ports for unparalleled connectivity options. 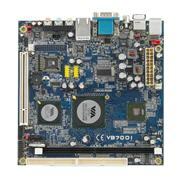 Fully compatible with Microsoft Windows 2000/XP, CE and XPe, and Linux operating systems, the VIA VB7001 Mini-ITX mainboard offers a comprehensive suite of drivers. The VIA VB7001 Mini-ITX mainboard is also fully compatible with all Mini-ITX, FlexATX and MicroATX chassis and associated accessories.